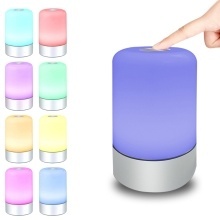 Do you enjoy the colorful mini cute LED night light? This touch sensor night lamp with gorgeous lighting effects must your ideal choice! Touch sensor, easy to operate, you can touch for 3 levels(low/medium/high)warm white light color brightness and long press for colorful light cycle mode and you can touch for static colorful light in colorful light cycle mode. Excellent LED beads, flicker-free and anti-glare light without strobes and radiation, it can keep your eyes away from exhaustion. Built-in 1 * 3.7v 1800mAh high capacity rechargeable battery, it is energy-saving, user-friendly and endurable. Safe PC lamp shade provides you soft and comfortable light, creating warm and romantic atmosphere for you. Mini size and light in weight makes you carry easily and free up more space for you. When light up it and then with the fascinating Jazz music, providing you a better sleep. Bringing you to remember the good old times when acting in the beautiful evening.